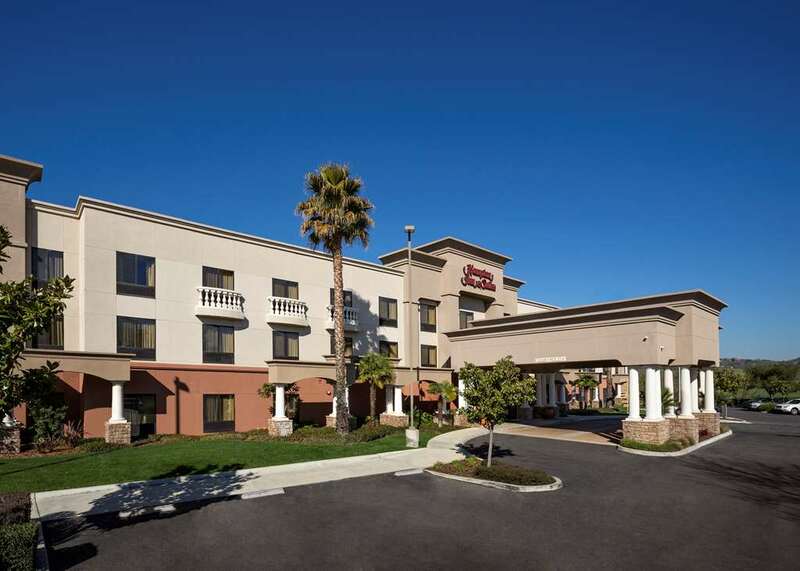 The Hampton Inn - Suites Paso Robles CA hotel is located at the junction of Highways 101 and 46 West in Central California*s coastal region halfway between San Francisco and Los Angeles. Nestled at the gateway between wine and castle country the Hampton Inn - Suites is elegantly appointed in an upscale Mediterranean flare. Paso Robles California area attractions include over 250 wineries and vineyards the renowned Hearst Castle several championship golf courses California Mid State Fairgrounds Lake Nacimiento Mission San Miguel Cal Poly University and Lake San Antonio. Take a short scenic drive to the beautiful California coast and enjoy the charming beach towns of Cambria Morro Bay San Simeon or Pismo Beach. The Hampton Inn - Suites Paso Robles features 81 guest rooms including Standard Double Queen and Standard King Deluxe Double Queen and King Suites. Our spacious guest rooms are equipped with phones voicemail complimentary in-room high-speed internet access refrigerators and microwaves iron and ironing board coffeemaker hair dryer and remote controlled color cable television. Our Hampton Inn - Suites hotel offers a free hot breakfast convention facilities for up to 100 a guest business center a heated outdoor swimming pool and whirlpool a fitness center Suite Shop and Wine Cellar.